This week I’m posting my first ever fiction story to appear on this blog. It also happens to be the first short story that I have ever written to fit the 140-character Twitter format. My inspiration for this form comes from Jennifer Egan’s short story “Black Box,” originally published on Twitter and then in The New Yorker. The day before my grandfather’s entire platoon was wiped out—all except for him—they spent the afternoon digging trenches in a Korean graveyard. A man from a nearby village had begged them to stop. It was bad luck, he told them. No good would come of it. They would be cursed. But the Chinese were on the other side of the hill. It was war. They did what they had to do, and my grandfather was the Lieutenant. He told them to keep digging. In all likelihood, they unearthed bodies as they dug. Yellowed bones, human hair. But my grandfather didn’t talk to us about those things. He was a storyteller. He told us instead of another discovery: a jade Buddha, sea green and the size of his hand. When the Korean man from the village saw it, he started crying. Who knows how long the Buddha lived there, under the earth—centuries? My grandfather was the Lieutenant. He put it in his knapsack. That night the men used the grave stones for washboards. They ate from their mess kits, joked about home—how they’d never eat rice again. A private in my grandfather’s unit, Eddie from Kentucky, stayed up one night to finish a book. Get some sleep, the guys told him. It was a damn good book, though, and he’d wanted to finish it. Eddie read the last chapters by the beam of his military-issue flashlight. The next morning, the Americans were overrun. Bullets strafed the air. Smoke rose in plumes, then clung to the ground in low, dark clouds. A bullet slid through Eddie’s chest and pierced his lung. He died choking for breath, unable to speak. But he finished it, my grandfather said. What was the book? I asked. The Call of the Wild, my grandfather said. The rest of my grandfather’s unit died around him. My grandfather was lucky. He heard the grenade as it dropped over the wall of the trench, as it danced down the concrete steps. One, two—and he lunged sideways—three. When I was young I ran my finger across the scars, over the jagged shrapnel that racked his body and crawled like spiders under his skin. By the time he died—62 of cancer—he’d had 12 operations. At 58, the metal still wriggled inside his leg, searching out an artery. After the war, my grandfather came home and went back to college. He met my grandmother, they married, and life happened. They had three girls. One, two—and a gap of six years—three. My grandmother still tells the stories my grandfather told her about the war, about his childhood. I try to pay attention to how they warp and bend over time. How her memory matches up against mine, against my aunts’, against my mother’s. Who’s to say who’s right? Memory works like shrapnel. Long after a callus has grown over a wound, memory still cuts inside you. Drawing up new pain or lying dormant—for a time. 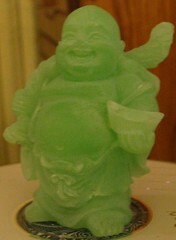 Often, my mind goes back to that jade Buddha. My grandmother says it was stolen from my grandfather on his way home from war. And yet I can’t believe this. Did I not see it as a child? That soft, green belly, that laughing mouth? Winking at me from some high shelf, or the back of a dark cabinet? The last few days he was in the hospital, he hallucinated that he was back in Korea. I was only six at the time, but still. Hadn’t I seen the Buddha, clenched in the grip of his sweating hand? Begging for one last miracle, all the while still crouched in the trenches, the ping of the grenade hitting against the concrete steps. One, two—yes, hadn’t I seen it then?—three. It’s time to declare the new age of the short story. It’s time to laud the concise. It’s time to realize that in this day and age of blogs and online journals and YouTube videos, print media—books and newspapers, especially—are falling behind our modern needs. What is it about these online mediums that we find so compelling? We read fewer books these days, and it’s not that we’re less educated, or less intellectual, or stupider than our forebears. We’re busy. Driving on clogged highways from one place to another, working long hours at the office, shopping for groceries or catching up with the daily updates on the presidential campaign. I’m overwhelmed myself, and as an aspiring writer, it’s my job to read everyday. Yet any time I get the chance to relax, I find myself unwilling to begin a novel when I know that I won’t have time to read it. Take Richard Ford’s new novel, Canada. After I read a New York Times book review purporting it’s genius (and it is terrific, so far), I downloaded it onto my Kindle and began on the first of 400 or so pages. Then school started, with it a flurry of papers and assignments, and I tried to fit it in where I could. On the elliptical. In the car while driving to class. Shampooing in the shower. Yeah, exactly. It doesn’t work. By the time I’ve cracked open the Kindle again, I have to spend the first ten minutes just trying to reorient myself within the pages. Sorry, but that’s not the literary experience I want. So how do we adjust to our modern time? I vote the short story. What better form to occupy the tenuous space between long-form literature and fragment-style online writing? What better form to offer us the rejuvenating experience of one writer’s pure, individual (edited) voice, as compared to the frenetic copy-pasting, quoting, and linking of blogs? What better form to supply a complete literary experience within a compact, tightly packed unit, all the more powerful for its quick, sharp punch? Yes, I vote the short story. There are so many fantastic works, in so many fantastic styles—not just contemporary authors, but our classic literary heroes, too. Just this month The New Yorker published a Fitzgerald story. Only a few months back, they published a very different kind of story, “Black Box,” by Jennifer Egan, which was originally published in short bites of prose on Twitter. Egan’s project demonstrated how the fragmented form of internet writing can create a new kind of literary experience. (Though she worked through a very new medium, she did plan out the story for months beforehand with the trusty pen and notebook of writers of old.) Still, the story works well with the form, and it is a chilling, wonderful piece. You can read it online at The New Yorker here if you subscribe. Esquire holds a summer short fiction contest. The Atlantic has its yearly short fiction edition. Every year, The Best American Short Stories collects the best of the best from the nation’s top literary magazines, and both new and familiar names grace the pages. Not to mention there are thousands more online from zines to short story data bases to the websites of standard literary magazine, and they’re one of the only things you can find online for free. Yes, some stories are “subscriber only” but have you ever read a novel online for free? Ever? Yeah, me neither. My goal for this blog in the future, then, is to engage the short story, especially those written by our contemporary authors. How are we defining ourselves, these days? What can our authors tell us about the world we live in, our systems of values, our means of perception? I don’t want to write a book review for a novel you won’t have time to read. I don’t want you to simply take my word for it, my own personal analysis that could exalt or condemn a book. What I’d like to offer you is an opportunity not only to read, but to engage. A fireside chat of a sorts, but let’s call it a coffee break, or better yet—a bourbon break. The goal is to enter together into a discussion of the works that affect us (and affect us because we have time to read them). Here’s what I plan to do: read short stories from a variety of publications, post the links, and discuss. No author wants you to simply move your eyes across the page and afterwards post on Goodreads about your accomplishment. When they construct a story, they desire you to think, and to continue thinking. A story is a silent conversation that passes from the writer to the reader. You may read about a character with a talking pig, but the situation will hopefully imply a far deeper meaning than what appears on the surface. My goal is to explore, explicitly, this implicit conversation between the writer and the reader. So with that, I’ll return to this blog’s title. Write drunk and edit sober, an adjustment of the famous Hemingway quote that I’ve adopted to have a new meaning—to write with the heart and to edit with the mind. For this project, I propose a similar mantra. How about “Read drunk; analyze sober”? Let’s engage with literature. Let’s get drunk off it, drunk on emotion and the reverie of words and phrases. But then let’s analyze. Let’s look at author Q&A’s. Let’s consider what this literature does for us in our modern time. Why am I right for this job? The same reason you are. We’re interested minds who wish to engage with story—that wonderful place where an author can craft art out of communication and reveal meaning in a series of contiguous events.